The page outlines the Functions, Priorities, Supporting Agencies of the society. Promote the principle and practice of primary ear and hearing health care, as a fundamental aspect of public health intervention. 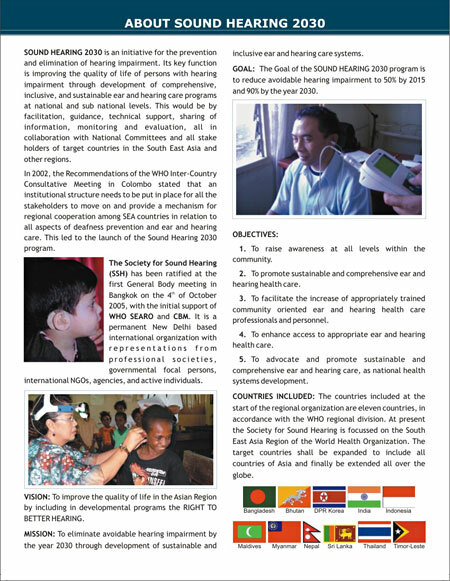 To facilitate the resource mobilization in the countries for enhancing access to simple and appropriate ear and hearing health carel. To identify good practices, and to exchange such experience and information on all aspects related to hearing loss and impairment. 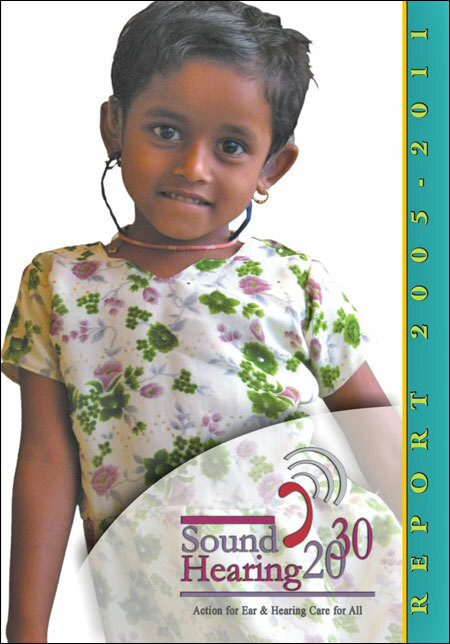 To collaborate with national programmes on deafness hearing impairment. 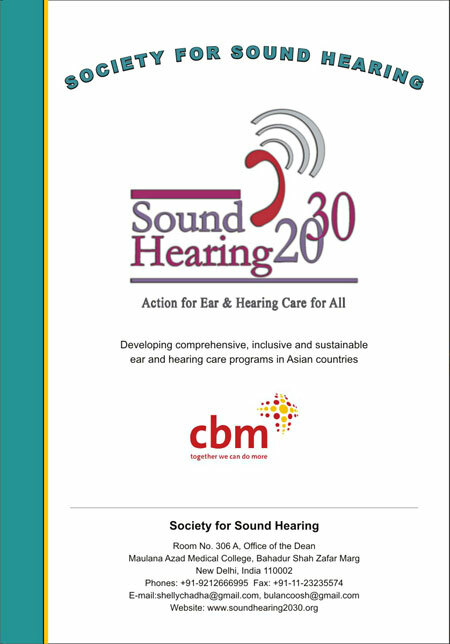 To work closely in partnership with national expertise, institutions, committees, national and international Civil Society, WHO and other development partners in promoting better hearing for all. Care for the underprivileged communities. Prevention programs at all levels of services. Infrastructure development specially focused on the primary and secondary level. It carries the logos of WHO and CBM. WHO Headquarters and WHO SEARO has been actively involved since the development of the organization in its early phase, with great support from the Prevention for Hearing Impairment(PHI-PBD) official Dr Andrew Smith (founding member) and Regional Advisors for Disability, Prevention of Injury and rehabilitation (RA-DPR) officials: Dr Madan Upadhyay (founding member), Dr Santikarn Chamaiparn and Dr. Sara Varughese. Technical support as well as financial support for meetings, symposiums and epidemiological data update has been provided by the W.H.O. SEARO alongwith great inputs and advice of Dr Sawat Ramaboot (founding member) and Dr U Than Sein. CBM, under the leadership of Dr Allen Foster has been the main financial sponsor, for organizational activities as well as programs and meetings. Ms Silvana Mehra (founding member) as well as other Regional Directors and the staff of CBM has given ongoing technical support for set up, capacity building and program planning of the organization, as well as distribution of recommendations through all CBM channels. This in turn has initiated implementation activities in the form of community ear and hearing / prevention of hearing impairment projects in several locations in the region. IMPACT through involvement of Dr Padman Ratnesar (founding member), HEARING INTERNATIONAL through involvement of Dr Suchitra Prasansuk (founding member), IFOS through Dr Arun Agarwal (founding member)and Dr M Alauddin (founding member) have given invaluable inputs in the development of terms of reference and the rules of procedures of the organization. This page refers to Current Scenario on Disability. On 9 June 2011, WHO and the World Bank officially launched the first-ever World report on disability. This landmark report reveals that more than 1 Billion people in the world experience some form of disability. According to the World Health Organisation, 15% of the population of the world suffers with a disability. 80% live in middle & low income countires. 1/3rd of people of disabilities are children. 2/3rd of people of disabilities in these children could have been prevented. STRATEGY: The World report on disability recommends that governments and their development partners provide people with disabilities access to all mainstream services, invest in specific programmes and services for those people with disabilities who are in need, and adopt a national disability strategy and plan of action. In addition, governments should work to increase public awareness and understanding of disability, and support further research and training in the area. Importantly, people with disabilities should be consulted and involved in the design and implementation of these efforts. 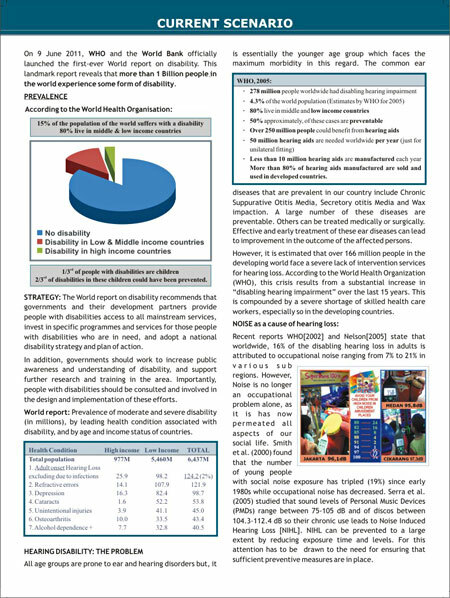 World report: Prevalence of moderate and severe disability (in millions), by leading health condition associated with disability, and by age and income status of countries. 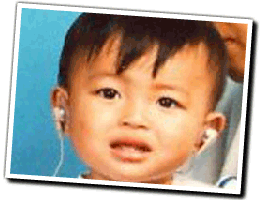 All age groups are prone to ear and hearing disorders but, it is essentially the younger age group which faces the maximum morbidity in this regard. The common ear diseases that are prevalent in our country include Chronic Suppurative Otitis Media, Secretory otitis Media and Wax impaction. A large number of these diseases are preventable. Others can be treated medically or surgically. Effective and early treatment of these ear diseases can lead to improvement in the outcome of the affected persons. However, it is estimated that over 166 million people in the developing world face a severe lack of intervention services for hearing loss. According to the World Health Organization (WHO), this crisis results from a substantial increase in "disabling hearing impairment" over the last 15 years. This is compounded by a severe shortage of skilled health care workers, especially so in the developing countries. Recent reports WHO and Nelson state that worldwide, 16% of the disabling hearing loss in adults is attributed to occupational noise ranging from 7% to 21% in various sub regions. However, Noise is no longer an occupational problem alone, as it is has now permeated all aspects of our social life. Smith et al. (2000) found that the number of young people with social noise exposure has tripled (19%) since early 1980s while occupational noise has decreased. Serra et al. (2005) studied that sound levels of Personal Music Devices (PMDs) range between 75-105 dB and of discos between 104.3-112.4 dB so their chronic use leads to Noise Induced Hearing Loss [NIHL]. NIHL can be prevented to a large extent by reducing exposure time and levels. For this attention has to be drawn to the need for ensuring that sufficient preventive measures are in place. 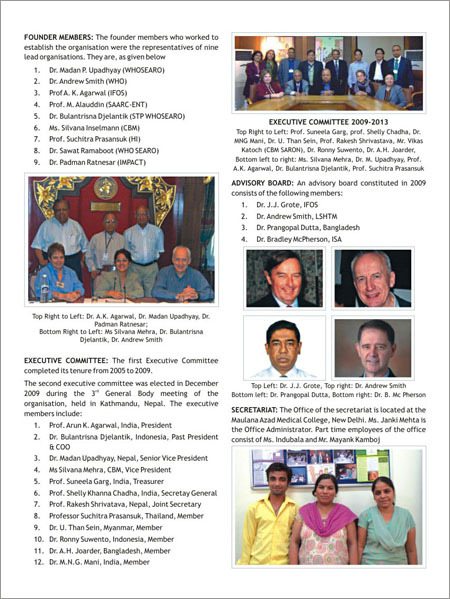 This page refers Founder members, Executive Committee, Advisory Board and Secretariat. EXECUTIVE COMMITTEE: The first Executive Committee completed its tenure from 2005 to 2009. 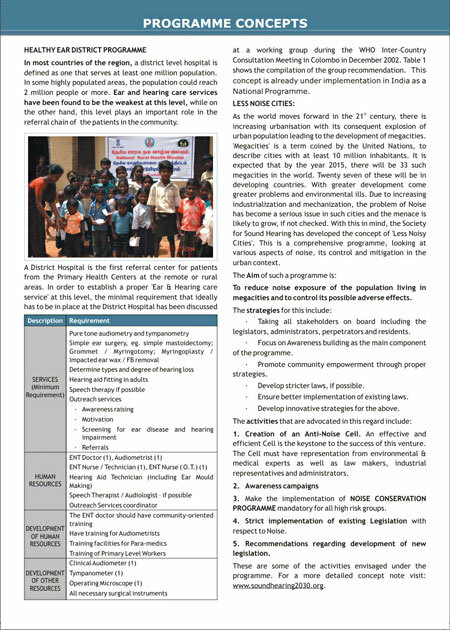 SECRETARIAT: The Office of the secretariat is located at the Maulana Azad Medical College, New Delhi. Ms. Janki Mehta is the Office Administrator. Part time employees of the office consist of Ms. Indubala and Mr. Mayank Kamboj. An image of the secretariat members.